Archway Glendale partners with Boonli.com to provide a secure, fast and easy-to-use online ordering system. The Archway Glendale Lunch Program is entirely managed and distributed by our Parent Service Organization volunteers. The lunch program consists of pre-ordered, catered food, delivered daily by local food vendors. All profits go directly to the Parent Service Organization benefiting Archway Glendale students. Archway Glendale partners with Boonli.com to provide a secure, fast and easy-to-use online ordering system. This allows parents to view our school lunch menu, order, pre-pay and manage student lunches online. 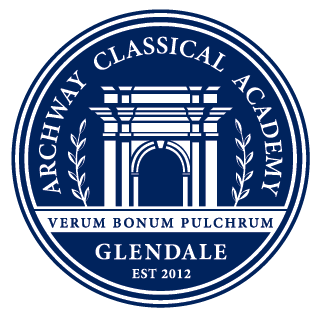 Sign In: the welcome page will display current information about the Archway Glendale lunch program. Click Order at the top of the navigation bar and select the correct month. Select the Order on the date to begin. First Lunch Date is: August 13th. Ordering for Monday and Wednesday April lunches is now open! Ordering for the first week of April will remain open until Friday March 29th at midnight. Weekly or Monthly ordering is available for MON & WED ONLY. Monthly ordering for our normal Tuesday, Thursday and Friday vendors is currently open and will close on the 24th as usual! We are very excited to be trying out a new vendor for the next two months in order to decide which direction we would like to take with our lunch program for next year! Our new vendor is a catering company called JRF Foods. Please read all of the information below to learn about the new company and the options available. They will provide a hot meal, with a vegetarian option available each day. The student is able to choose which meal option they prefer when they go up for their lunch. Meals include Hamburger/Hot Dog, Pastas, Orange Chicken, Breakfast for Lunch, Chicken Parmesan, Burritos/Tacos and Chicken Nuggets/Mac’N Cheese! Meals are made from scratch daily by JRF chefs beginning at 5:00am the day of service. They use fresh fruits and vegetables and source local and organic items as available. Meals are served with a vegetable (except breakfast for lunch), salad bar and a choice of milk or a water. Full access to the salad bar with each meal. Salad bar includes lettuce, croutons, salad dressings, veggies (carrots, cucumbers, broccoli), tomatoes, fresh fruit, cheese sticks. Salad bar a la carte option is available for anyone who would like salad without ordering a hot meal. JRF will provide staff to serve lunch to our kids but we will still need parent volunteers to help check students in and help students with the salad bar as needed. A special lower price is offered to our K-2 students as they eat smaller portions than the 3-5 grades. This still includes full access to the salad bar. We are going to try Weekly ordering with this vendor ONLY. Orders can be placed until midnight on Friday for the following week’s meals. Meals can also be ordered for the full month as well. Due to the difference in pricing per grade, the set-up for ordering is slightly different. There will be two or three menu cycles on your home page depending on the grades of your students. Unfortunately this is currently the only way we could incorporate the different pricing scales. April 19 – used to order Chick-fil-a, Barros & Subway for all grades. These menus will close on the 24th of the month as usual. April 19 K-2 – used to order Monday and Wednesday meals for K-2 students only. Weekly or monthly ordering is available. 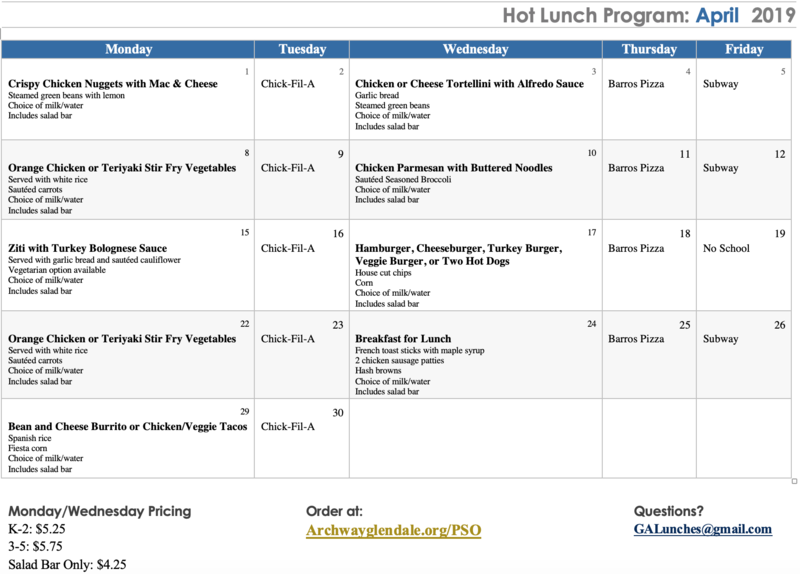 April 19 3-5 – used to order Monday and Wednesday meals for 3-5 students only. Weekly or monthly ordering is available. On each calendar day, please hover over the name of the Hot Meal to read the full meal description. Glendale Prep will also be incorporating JRF Foods into their menu on Thursdays and Fridays. They will maintain a larger salad bar and larger portion sizes for their kids so their pricing will be slightly higher. **Please spread the word about this new vendor to families who may not have ordered lunches in the past and ask them to give it a try as we feel it will provide healthy options and more variety in our menu. Over the summer we hope to survey both Archway and GP families and based on feedback decide what route we will take for our lunch programs next year! Monthly Ordering for our normal Tuesday, Thursday and Friday vendors is currently open and will close on the 24th as usual! Minimum Order Fee: A $1.00 fee will be charged for orders under $10.00. * Late orders will not be accepted and changes or cancellations (such as illness or last minute field trips) to an order cannot be made once the order has been placed and the pre-order date has closed. There will be no exceptions. Unclaimed meals may be given to students without lunch. For technical support (navigating the site), please email support@boonli.com. Please email galunches@gmail.com with any questions you may have and someone will get back to you as soon as possible.